ACC Telecom makes it easy for you to expand your business telecommunications regionally or nationally with our National Account Program through Toshiba America Information Systems, Inc. (TAIS) Telecommunications Systems Division. 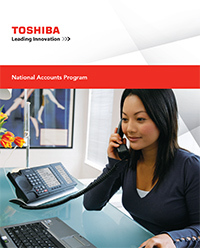 Toshiba implemented the Premier National Accounts Program in 1986 and is hands down the best National Account Program in the business- we encourage you to compare it to any program of its type! If your company has more than one location and you want to standardize your business phone systems and communications throughout your organization, our National Account Program through Toshiba provides a standard, simplified approach to purchasing, installation, and servicing your Toshiba telephone systems. 800+ Sales & Service Centers across the U.S. Consistent installation prices throughout U.S.
Value Plus for the BEST 5 & 7 Year Warranty in the Industry! Contact us or visit Toshiba National Account Program to learn more about starting a National Account with ACC Telecom and Toshiba today.